As part of some professional development I am leading this summer around Common Core, I created this “flipped” TED assignment to share with teachers (both to use for discussions and to show how to do a flipped assignment). The emphasis here is on how to do a close reading of a video (by The Teaching Channel), thinking about stance and choice and use of video to make a point. Feel free to give it a look and I would love feedback. I stumbled upon this site — Vuvox — the other day as I was reading a blog post about remixing in a college composition classroom. One of the students used this site to remix a graphic novel with a rap song. I decided to see I could create a media collage from last year’s National Day On Writing, with the theme of Why I Write. I used images from my classroom and a podcast collection that we created that day. Check it out and see if you can think of possibilities for the classroom. It’s always a pleasure when a fellow teaching friend writes and publishes a book. I am all for celebrating on their behalf. 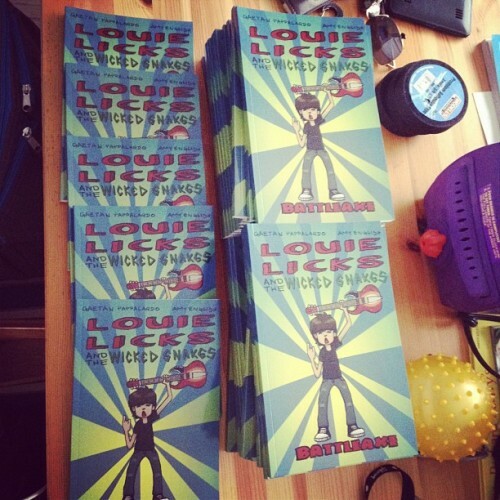 So I was happy to learn that Gaetan Pappalardo (part of the National Writing Project network and a regular contributor to Edutopia, and whose online motto is teach.write.rock) had finally gotten his children’s novel — Louie Licks and the Wicked Snakes: Battleaxe — out for sale. Gaetan writes a lot of great pieces about the connections between music and writing, and how to use that interest in music in the classroom. His short (self-published, I believe) novel builds on that idea of music having powers beyond what we hear, but the book does it with humor, adventure and even some wacky science fiction built in. I’ll admit: I am a sucker for stories that use music as the anchor. Here, the narrator — Louie Licks, an elementary student whose fame with his guitar is already legendary (if you go to his school) — shares with us his incredible adventure when his electric guitar gets stolen right before a gig at a breakfast at his school. The thief (disguised first as a milkman) is trying to tap the power of the guitar (you’ll have to read the book to understand what that is all about), and it is up to Louie and his drummer friend, Grady (my brutha! ), to save the day by saving the school … and possibly the world. Gaetan writes with flare (and the illustrations by Amy English are cute), and the voice of his young protagonist comes through loud and clear. I particularly liked his interactions with his little brother, whom Louie has nicknamed “Grunge.” The oddest character is Louie’s dead grandmother, who arrives at opportune moments to help Louie out of jams. (The guitar was hers before it was Louie’s.) There is also an entire part of the story that revolves around farting, so you know the boys in class will be chuckling over the passing of gas. A bonus is that Gaetan, who is a musician himself, has set up a website where Louie and his bandmates have recorded some of their music. 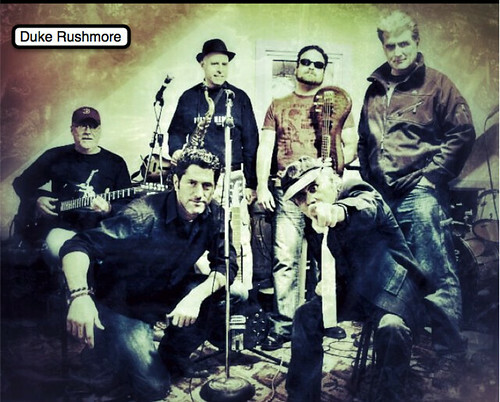 Take a listen to Louie Licks and the Wicked Snakes. I created this video a few weeks ago for a contest around representing your ideas of connected learning. It turns out there weren’t enough people in the contest (I am getting a token prize, so I am fine with that). I was trying to show how technology allows my students to connect to the world. A member of our band — Duke Rushmore — pulled together a little mixtape (wrong word, right?) from our recent gig. You can take a listen at our new Soundcloud site, and if you are up for it, please come visit our Facebook page and add us as a “like.” We’re trying to get our way to 100 people liking us. Hopefully, the music will help! I am always on the look-out for ways to teach my students some basic html coding, as a way to show them the “underneath” of the Internet. I’ll sometimes pull up a source code of a website we are using, and talk a bit about the coding that goes on to create the tools that they are using. A friend sent me a link to Mozilla Thimble, which is a fairly recent online tool that teaches a bit about coding, in an interesting way. Everything is online — from the coding itself to the publishing. One of the links from Mozilla is a “create an animal” page, and so I went there this morning, and spent a bit of time. What I love is that the interface shows both the html coding on the left, and the results on the right. 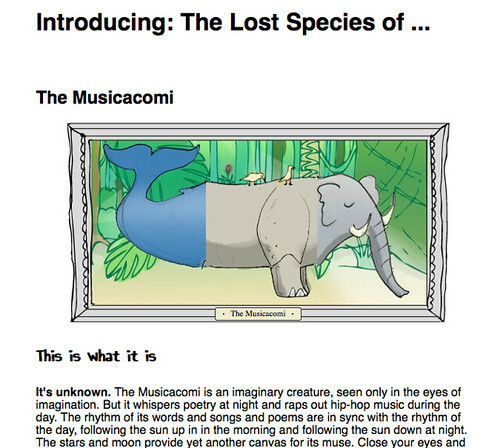 The instructions are simple (for the most part) and within minutes, I had created an imaginary beast and published it online (hosted by Mozilla). This kind of site might be a perfect introduction to coding, and creating,and you could easily tie it into a unit around animal habitats, too. I was recently interviewed by Erin Wilkey Oh for the National Writing Project’s Digital Is site about our science-based game design unit. It’s always nice to reflect a bit on a project that seemed to have struck a chord with students. You can see Erin’s write-up here, and then follow her links to a transcript of our chat. And of course, here is our Video Game Design Site. An interesting thing happened yesterday. I posted an introduction to a P2PU study group that I am part of around digital curation. I used a webcomic to create my intro (see yesterday’s post). And then, my friend Terry, who is part of the study group, took my comic and used a screencapture program to respond to my points about identity and curation. His views of my points was fascinating to listen to. I decided to go another step, and grabbed his video of his response, put it into Vialogues (which allows for discussions of videos), and then responded to his responses, which he (of course) added further responses, too. It’s an interesting concept, how these tools allow for interactions on a variety of levels (from comic to video and voice to chat), and I appreciate Terry for coming along for the ride with me as I explored the possibilities (plus, he gave me a new hat — see the end of the video to understand). You can join in, too. I’ve been through my fair share of Stephen King in my lifetime, and I have mostly enjoyed his stories. There are plenty of critics who take pot shots at him from a variety of angles, but I have found that if I go into his novels with the mindset of “story” and maybe “scary story,” then I am fine. He hits all the right notes when he is on his game. When King’s On Writing came out, I bookmarked it but then never got around to picking it up until now. It’s an intriguing look inside the mind of a popular writer, and there’s plenty of voice that comes through here, too, including his own pot shots right back at his critics. King has a lot to say about writing, but what I found the most interesting, to be honest, is the earlier sections where he talks about how broke into the world of writing. Mostly, it was through the support of his wife, Tabitha King (a writer in her own right), and On Writing does come across as sort of love letter to her. Never underestimate the support and ear of your spouse. There are also many threads of the horrific accident that happened to King one day, as he was walking down a rural road and was struck by a truck. Talk about mortality check. The middle sections of On Writing go deeper into the art of writing, as King sees it, and those sections work fine, but the best piece of advice is this: read. A lot. Read a lot of books, and pay attention to style, development of ideas, character voice. If you want to be a writer, you need to notice the craft of writing, and you do that by reading. Oh, yeah, and avoid using too many adverbs. King doesn’t like that — he thinks it is a writer, cheating. I’m sort of with him on that idea of avoiding too many flourishes and instead, stick to the story.